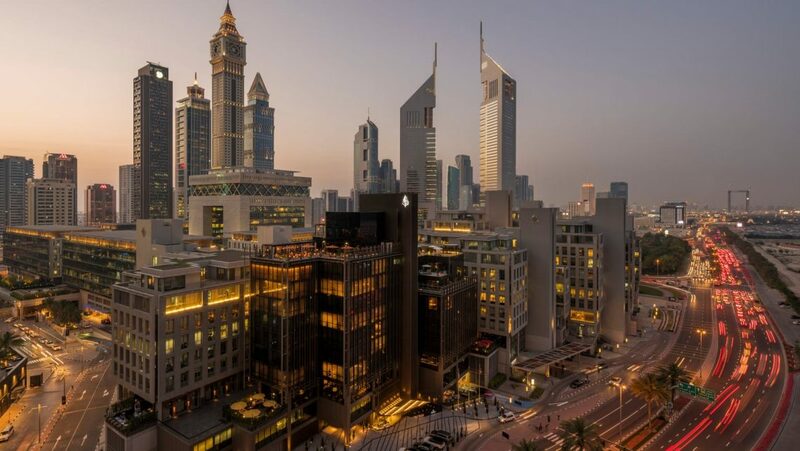 The Dubai International Financial Centre (DIFC) is a bustling hive of international business activity, with executives from all over the world stopping for conferences, meetings and other events. 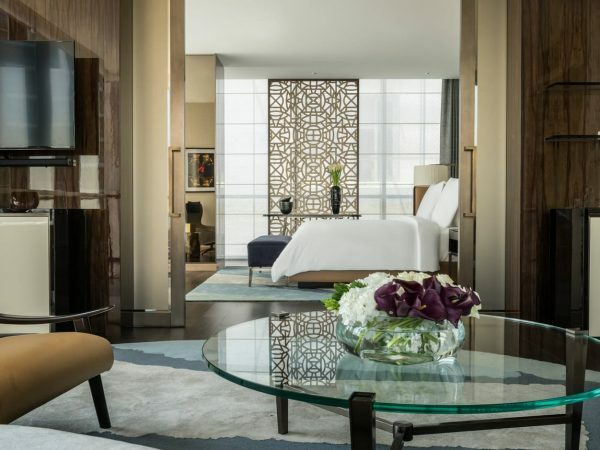 Of course, finding a perfect hotel here is essential for a work trip, but at the Four Seasons Hotel DIFC there’s also something for the leisure traveller. 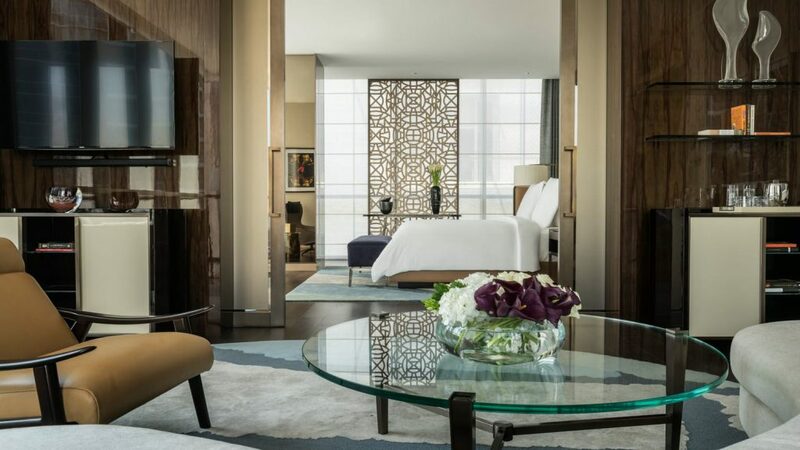 The hotel has the chic decor one might come to expect from a Four Seasons city property; it’s certainly more unique and welcoming than some of the other luxury hotels that are aimed at business clientele. Ducking into the reception area from the street, the lobby has the feeling of a luxury boutique and, later, exploring the other areas of the hotel, there’s a cosiness that is very welcoming. On arrival, moving directly from our air-conditioned car to the similarly temperate lobby, with a brief blast of hot air like a hair dryer in the middle, we were welcomed by staff who knew our names without being told and checked us in very efficiently. Our room was a muted sandy colour, with full floor to ceiling windows that overlooked the city, and a separate dressing area. The bathroom had a large walk-in shower, perfect for freshening up after our early morning desert and falconry excursion with Oriental Tours LLC Dubai. On the other side of Fours Seasons Hotel DIFC, one can access the hotel across a small pedestrian courtyard that zigzags away between some of the tall office blocks in the area. Four Seasons DIFC brings something of the French salon to Dubai however, with an area named the Penrose Lounge for seating and breakfasting that features armchairs, bookshelves and the sort of table that looks best when topped with a stack of afternoon tea goodies (which are, of course, available). This is a popular meeting location for the Dubai businessperson – it’s very likely than a few tables are deep in the sort of serious negotiation that an idle tourist comes to Dubai to avoid! There is, however, a sanctuary for the pleasure seeker on the roof, where one can find the Luna Sky Bar and glass-sided pool. 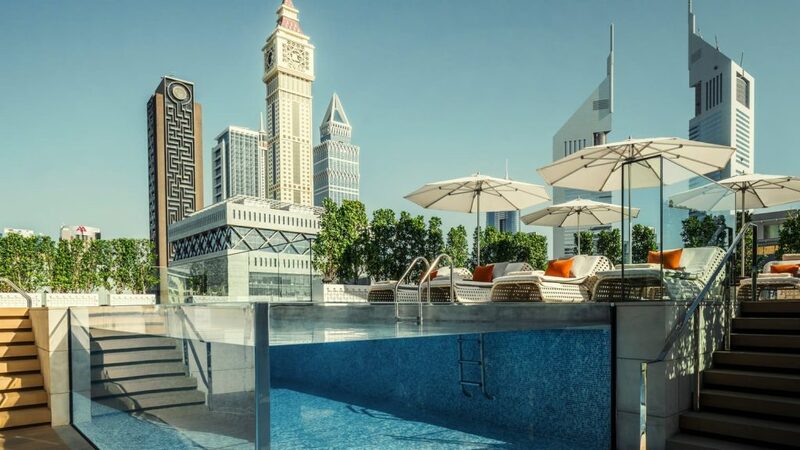 Light bites and drinks are served direct to your sun lounger beside the pool and the hours glide gently past as you watch the sun travel between the towers of Dubai’s skyline. And as the sun goes down, the fun is only just beginning as Four Seasons Hotel DIFC serves dinner and drinks at MINA Brasserie which, with its pastel banquettes, French vibes and summerhouse-style bar, has consistently been attracting Dubai’s cocktail set since its opening last year. 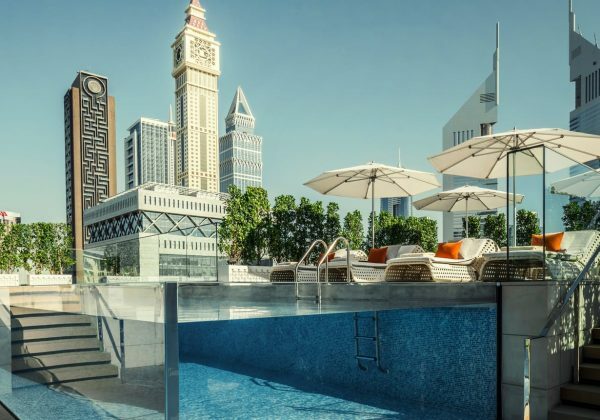 If you’re venturing out, the Four Seasons Hotel DIFC is less than a kilometre from the Burj Khalifa and Dubai Mall, where there is an excellent aquarium. Also within easy reach (let’s face it – as long as you avoid rush hour, it’s very easy to get almost anywhere around Dubai by car or public transport) are the souks beside Dubai Creek, the Al Fahidi Historical District and the impressive Jumeirah Mosque. In fact, the central location of this hotel means there are tourist attractions galore if you’re here for pleasure or even if you have a few hours to spare before your next meeting. 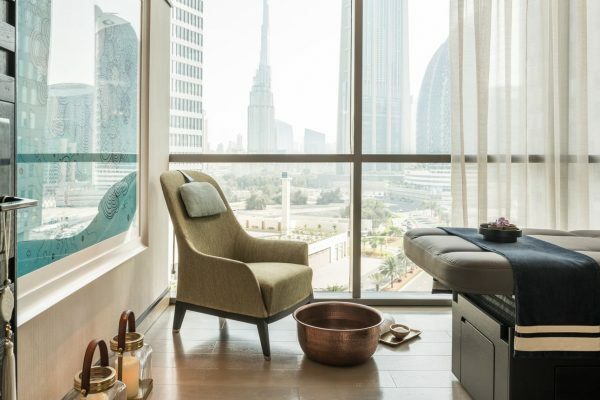 Finally, it would have been rude to enjoy such a relaxing stay without visiting the spa, also on the top floor, which boasts views of DIFC from the full height windows in the treatment rooms! 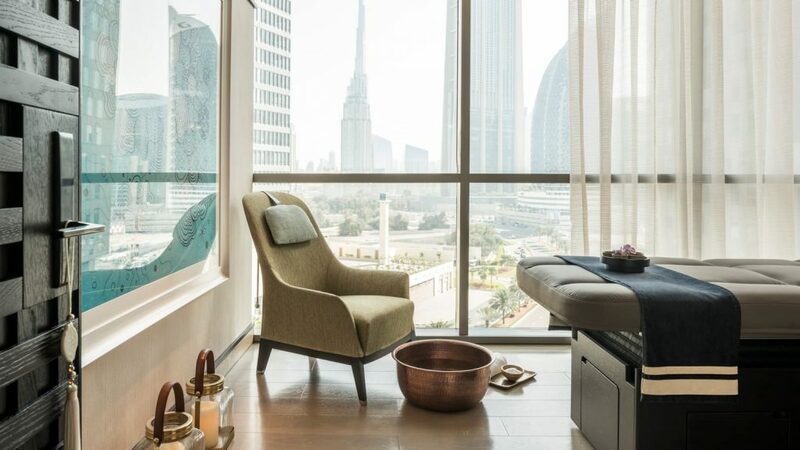 A relaxing massage with aromatherapy oils – I chose a fragrance based on mandarin that stayed with me for the rest of the afternoon – was exactly what was needed. My masseuse was very quick to notice areas that needed an extra bit of pressure and I was able to close my eyes and just enjoy the feeling of stress being soothed away.